Draining and ventilating brick veneer walls has always been challenging. Over the years there have been many draining and ventilation devices to keep the weep holes open from pea gravel to mortar collection devices. These products have been moderately successful in cavities of two inches or greater. However, the uses of mortar collection devices are not providing adequate drainage and ventilation in cavity walls of one inch or less. 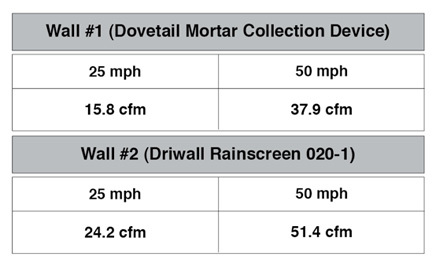 The trend in brick veneer cavity wall construction is moving from two inches to one inch of airspace or less. An influence to this is the increase in moving insulation to the brick cavity. This trend is bringing more attention to properly draining brick cavity walls of one-inch airspace or less. In brick veneer walls mortar bridging is occurring in cavity walls where mortar collection devices are placed above the flashing in brick cavity walls that are one inch or less. This occurs because not all of the mortar falls to the bottom of the cavity to be managed by the mortar collection device; instead, a large quantity of the mortar that originally was designed to fall to the bottom of the cavity clings between the brick and the back-up wall. The mortar bridges that are formed from this create ledges for water to collect which reduces proper drainage and ventilation in the wall. Without proper drainage and ventilation, brick veneer walls are subject to mold, premature rotting and efflorescence. Keene Building Products and Architectural Testing Inc. did a comparison test of one-inch brick veneer walls with one-inch airspace. The goal of the test was to compare mortar bridging, drainage and ventilation. A product comparison test was performed at Architectural Testing, Inc., in York, Pennsylvania. The test included two, five feet wide by ten feet tall high steel frames that were constructed to support the brick test walls. Wall one consisted of product “A,” a dovetail mortar collection device which utilized three weep vents in the top and bottom courses of the brick. Wall two included KEENE’s Driwall Rainscreen 020-1 and employed three Driwall weep vents in the top and bottom courses of brick. Each wall was constructed with standard modular bricks with a smooth face and Keystone Type N mortar. Both walls were constructed with a single course of bricks with a one-inch cavity. All products were installed to manufacturer’s recommendations. Air Infiltration: ASTM E 284-04, Standard Test Method for Determining the Rate of Air Leakage Through Exterior Windows, Curtain Walls and Doors Under Specified Pressure Differences Across the Specimen. Testing was conducted at 1.57 psf (25 mph) and 6.24 (50 mph) positive static air pressure difference. Water Drainage Performance Test: This test introduced five gallons of water into each cavity wall and captured the amount of water drained out of the weep vents. After reviewing the product comparison testing done by ATI, Keene Building Products recommends a full wall drainage product in all brick veneer walls of one-inch airspace or less. 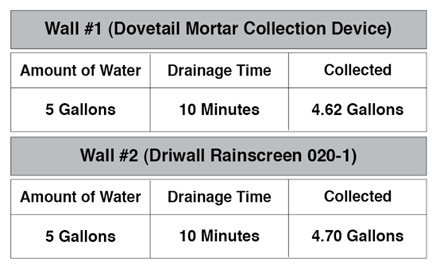 When specifying one of our Driwall Rainscreen products in your brick veneer wall, you are eliminating all mortar bridging and dramatically increasing ventilation as well as reducing all problems associated with draining and ventilating walls. Keene Building Products Driwall Rainscreen conforms to all of the BIA recommendations.